The eyes of the world are firmly fixed upon Meghan Markle, after her beautiful wedding to Prince Harry in May 2018. But who is this enigmatic new Royal - and what propelled her to become the fierce woman we see today? 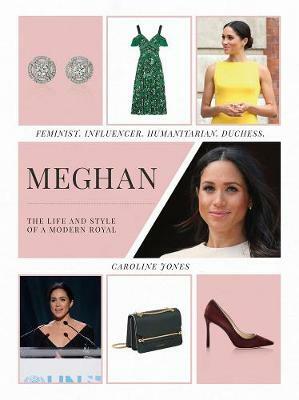 Get to understand what really makes the new Duchess of Sussex tick with this illustrated biography charting the key events and driving forces behind the actress-turned-princess. With the insight and visual intimacy that makes it feel like Meghan's own personal scrapbook or Instagram feed, in Being Meghan you can read about what inspired the LA native to become a feminist and how her charity work began at the tender age of just 13. Follow the evolution of Meghan's personal fashion style, along with details of her love of food and travel, with favourite recipes and vacation inspiration. Caroline Jones is a freelance writer specializing in health, beauty, fashion and lifestyle subjects. A former senior editor on several national newspapers and magazines, she is also an accredited life coach and the author of Kate: How to Dress Like a Style Icon, The Busy Girl's Guide to Looking Great, The Desperate Housewife's Guide to Life and Love, 1001 Little Fashion Miracles and 1001 Little Ways to Spend Less & Look Beautiful. Caroline lives in London with her husband and daughter.